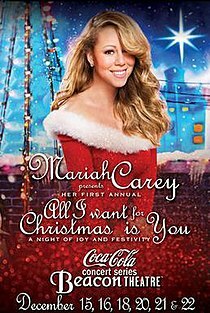 All I Want for Christmas Is You, a Night of Joy and Festivity is the first concert residency by American singer Mariah Carey. Performed annually at the Beacon Theatre in Manhattan, New York, the residency began on December 15, 2014, and concluded on December 17, 2018, after completing six legs and thirty-four shows. Billboard revealed that the six dates had sold out with a total of 16,196 tickets while grossing $1.5 million during the first leg of the residency. The main set list for the show encompassed songs from Merry Christmas and Merry Christmas II You, with additional non-holiday tracks. The show also included "a cast of forty, including a gospel choir, a clutch of carolers, several acrobats a hyperactive round of kid singer/dancers, and Santa Claus." Mariah Carey released her fourteenth studio album, titled Me. I Am Mariah... The Elusive Chanteuse, on May 27, 2014. It debuted at number three on the Billboard 200 album chart with opening week sales of 58,000 copies in the United States, and number one on the Top R&B/Hip-Hop Albums chart. Carey embarked on her eighth concert tour called The Elusive Chanteuse Show in October and November later that year, whereby she performed concerts throughout East Asia, South East Asia and Australasia. During the Australasian leg, Carey announced that she would take up residency at the Beacon Theatre in the New York City borough of Manhattan to be performed annually in December, as a twentieth anniversary celebration of the release of her first Christmas album, Merry Christmas, in 1994, as well as her second Christmas album, Merry Christmas II You (2010). Carey said in an announcement "I can't imagine being anywhere more special than live on stage, in my hometown, celebrating with my fans during the Christmas season, my most treasured time of the year, I can't wait!" Jim Farber of the New York Daily News stated that while Carey "seemed nervous and out-of-breath," the show had "a strange allure." Steven J. Horowitz from Billboard praised the singer's first performance at the venue, writing: "Carey accomplished what she came to do: spread Christmas cheer." Jon Caramanica from The New York Times who also reviewed the first show wrote the singer felt "utterly at ease" and commended her engagement with the audience. Following the announcement of the residency in October 2014, tickets for shows on December 15, 16, 18 and 20 went on pre-sale on November 3 for Citigroup cardholders, while general release followed a week later on November 10. Additional dates for December 21 and 22 were later released. Billboard later announced that the six dates generated a 100% attendance, with Carey playing to a total of 16,196 people and the shows grossing $1,563,173 in total. In October 2015, a new string of dates were announced once again at the Beacon Theatre with tickets available on October 17 via Ticketmaster. "Hark! The Herald Angels Sing" / "Gloria (In Excelsis Dio)"
"Here Comes Santa Claus (Right Down Santa Claus Lane)" / "Housetop Celebration"
"Emotions" wasn't performed on the first night. "We Belong Together" wasn't performed on the first and second nights. On selected dates, a choir alongside background singer Trey Lorenz performed "Jesus Oh What a Wonderful Child" as an interlude. John Legend joined Carey to perform "When Christmas Comes" at the December 7, 2016, show. Legend is featured on the single release studio version of the track. R Kelly joined Carey to perform a cover of Nat King Cole's song "The Christmas Song" at the December 8, 2016, show. Jussie Smollett joined Carey to perform "Christmas Time Is in the Air Again" on December 17, 2016. "Emotions" was performed in Paris and Madrid. A snippet of "One Child" was performed in Leeds. Snippets of "Miss You Most (At Christmas Time)" and "Caution" were performed in Brussels. ^ Lopez, Francisco (October 31, 2014). "Mariah Carey's 'All I Want For Christmas Is You' performance at the Beacon NYC". AXS.com. Retrieved January 28, 2015. ^ Gamboa, Glenn (October 31, 2014). "Mariah Carey sets holiday shows at Beacon Theatre". Newsday. Retrieved January 28, 2015. ^ a b Farber, Jim (December 15, 2014). "Mariah Carey overdoes herself at wavering Beacon Theatre show: concert review". Daily News. New York. Retrieved January 28, 2015. ^ a b c Stern, Bradley (August 18, 2014). "Mariah Carey Announces 'The Elusive Chanteuse Show': See The First Tour Dates". Idolator. Archived from the original on October 6, 2017. Retrieved October 6, 2017. ^ a b Brandle, Lars (September 18, 2014). "Mariah Carey Announces 'Elusive Chanteuse' Tour of Australia". Billboard. Archived from the original on October 6, 2017. Retrieved October 6, 2017. ^ a b c Gamboa, Glen (October 31, 2014). "Mariah Carey sets holiday shows at Beacon Theatre". Newsday. Archived from the original on October 6, 2017. Retrieved October 6, 2017. ^ Smith, Courtney E. (November 3, 2014). "Mariah Carey Announces NYC Christmas Concerts". Radio.com. Archived from the original on October 6, 2017. Retrieved October 6, 2017. ^ Horowitz, Steven J. (December 16, 2014). "Mariah Carey Brings Christmas Cheer to NYC's Beacon Theater". Billboard. Retrieved January 28, 2015. ^ Caramanica, Jon (December 16, 2014). "A Diva and a Holiday, Intertwined". The New York Times. Retrieved January 28, 2015. ^ "Mariah Carey kicks off Christmas extravaganza in NYC". Rap-Up. December 16, 2014. Archived from the original on October 6, 2017. Retrieved October 6, 2017. ^ a b "Billboard Boxscore :: Current Scores". Billboard. January 28, 2015. Archived from the original on January 28, 2015. ^ a b Goodman, Jessica (October 9, 2015). "Mariah Carey announces second annual Christmas concert series". E! News. Retrieved October 16, 2015. ^ "Current Boxscore". Archived from the original on January 17, 2017. ^ "Current Boxscore - Beacon 2017". Archived from the original on January 27, 2018. ^ "Current Boxscore - London 2017". Archived from the original on January 1, 2018. ^ "Current Boxscore - Manchester 2017". Archived from the original on May 24, 2018. ^ "Current Boxscore". Archived from the original on January 10, 2018.